New York – It’s more than two hours before a 1pm tip-off at Madison Square Garden and Jonah Bolden looks like he’s already been working out for a while. Bolden is running through drills with the assistant coaches – pick-and-rolls, pick-and-pops, corner threes and more. 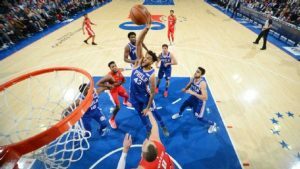 “We’re doing a lot of film so we’re seeing what we’re lacking, where our weaknesses are; that’s helping me – going through film, and playing a little more in the rotation with the guys so it’s starting to come together,” Bolden tells ESPN after the team’s win over the Knicks – a game in which he pulled down nine boards, tying his career-high. The four-year deal – of which two years are fully guaranteed – shows the team has faith in the Australian, but early on, Bolden spent a lot of time being shuffled back-and-forth between the NBA and the team’s G-League affiliate, the Delaware Blue Coats. It was but one more obstacle to overcome for Bolden on the road to cracking an NBA rotation. To the outside world, the back-and-forth may seem like a hindrance, but Bolden says he understands that system is supposed to aid in player development.